(AP) -- A deal for Comcast Corp. to buy a controlling stake in NBC Universal and create one of the most powerful media companies in the world is taking longer than expected as the current owners tussle over price. Further complicating matters is Vivendi SA's recent public statement that it might not sell its minority stake in NBC Universal at all. Such a decision could foil General Electric Co.'s plans to then sell a majority interest to Comcast. Comcast, the largest cable TV operator in the United States, wants NBC Universal largely for its lucrative cable channels, but it isn't likely to raise its offer. If GE had to spend more money to get Vivendi to sell, it will have to absorb the additional cost. That's because Comcast's agreement with GE is "set" and separate from the Vivendi talks, according to a person who is familiar with the situation but spoke on condition of anonymity because the person is not authorized to disclose private negotiations. Plans currently call for GE, which owns 80 percent of NBC Universal, to buy Vivendi's 20 percent stake and sell 51 percent ownership in the entire unit to Comcast for about $5 billion to $7 billion in cash. Comcast would contribute cable networks such as E! and Style to a new NBC Universal joint venture with GE, raising Comcast's bid to about $15 billion. The new NBC Universal would carry $8 billion to $10 billion of debt and operate under Comcast as its majority owner. But to make it work, Vivendi first has to sell its stake, and a top Vivendi executive told investors at a conference in Barcelona on Thursday that it doesn't have to sell NBC Universal this year. 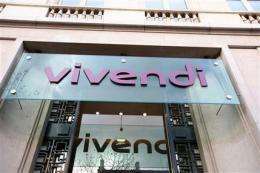 "We're not forced to do anything," Vivendi Chief Financial Officer Philippe Capron said. "We can also just say no." Vivendi, a media and entertainment conglomerate based in Paris, could be posturing because all sides have a reason to do the deal. GE, a technology, media and financial services company with headquarters in Fairfield, Conn., wants to unload NBC Universal, a unit that doesn't fit in well with its other businesses. The cash would help prop up its financing unit, GE Capital, which posted big losses from real estate and other industries during the financial meltdown. Vivendi also could use additional funds especially after last week, when it took a controlling stake in Brazilian telecommunications operator GVT SA for $4.2 billion. The French company has called its NBC Universal holding as "non-core." Comcast, meanwhile, wants to beef up its content assets. NBC Universal spans the NBC and Telemundo broadcast networks; cable channels such as Bravo and CNBC; the Universal Pictures movie studio and Universal theme parks. The acquisition would turn the Philadelphia-based cable TV operator into one of the world's largest entertainment companies. An agreement between Comcast and GE was supposed to be announced as early as this week. But now the parties are bracing for talks to stretch into December. Vivendi's Capron said no decision has yet been made. "We're not there yet. I read the papers like all of you so I learn about all the negotiations with GE that way. Apparently they're close to a deal with Comcast, which means that they would need to be close to a deal with us," he said. Capron said Vivendi had no interest in being part of a new Comcast-controlled NBC Universal, but he said the decision on whether to exit the company is "a bit more complex" this year. Vivendi has an annual option to dispose of its stake in NBC Universal. This year's window runs from Nov. 15 to Dec. 10. GE has right of first refusal and is expected to buy that stake. However, if Vivendi does not agree on a price with GE, Vivendi can either hold on to its shares or sell them to other investors through an initial public offering. Either option could derail the Comcast-GE deal. "This year's a bit different because this decision that we have to take in the next three weeks is in conflict with the GE-Comcast deal," Capron said.